Isoniazid is used in conjunction with other antituberculosis agents in the treatment of clinical tuberculosis. The American Thoracic Society (ATS), US Centers for Disease Control and Prevention (CDC), and Infectious Diseases Society of America (IDSA) currently recommend several possible multiple-drug regimens for the treatment of culture-positive pulmonary tuberculosis. These regimens have a minimum duration of 6 months (26 weeks), and consist of an initial intensive phase (2 months) and a continuation phase (usually either 4 or 7 months). 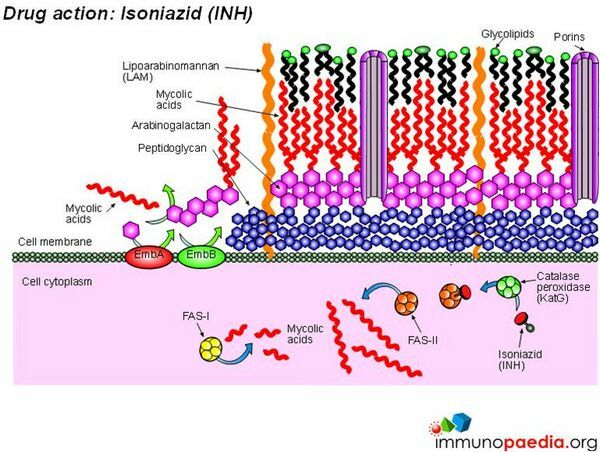 Isoniazid is considered a first-line antituberculosis agent for the treatment of all forms of tuberculosis caused by Mycobacterium tuberculosis known or presumed to be susceptible to the drug. Isoniazid is commercially available in the US alone or in fixed combination with rifampin (Rifamate®) or in fixed combination with rifampin and pyrazinamide (Rifater®). The fixed-combination preparation containing rifampin, isoniazid, and pyrazinamide (Rifater®) is designated an orphan drug by the US Food and Drug Administration (FDA) for use in the treatment of tuberculosis. Although oral isoniazid is preferred for the treatment of tuberculosis, the drug may be given IM for initial or retreatment of the disease when the drug cannot be given orally. 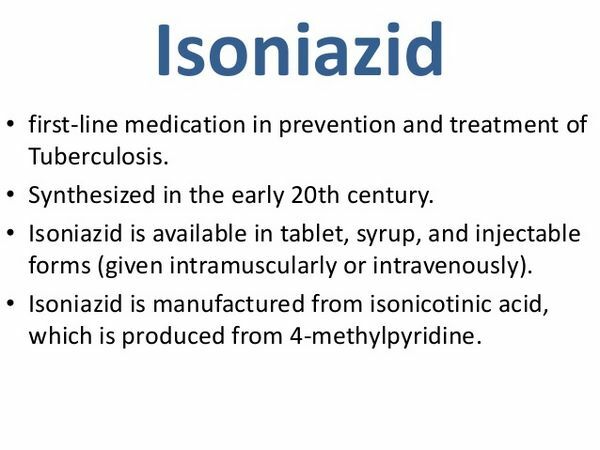 Isoniazid usually is used alone for the treatment of latent tuberculosis infection to prevent the development of clinical tuberculosis. Previously, “preventive therapy” or “chemoprophylaxis” was used to describe a simple drug regimen (e.g., isoniazid monotherapy) used to prevent the development of active tuberculosis disease in individuals known or likely to be infected with M. tuberculosis. However, since use of such a regimen rarely results in true primary prevention (i.e., prevention of infection in individuals exposed to infectious tuberculosis), the ATS and CDC currently state that “treatment of latent tuberculosis infection” rather than “preventive therapy” more accurately describes the intended intervention and potentially will result in greater understanding and more widespread implementation of this tuberculosis control strategy. Individuals at risk for developing tuberculosis include those who have been recently infected with M. tuberculosis and those who have clinical conditions that increase the risk of latent tuberculosis infection progressing to active disease. The likelihood that a positive tuberculin test represents a true infection with M. tuberculosis is influenced by the prevalence of infection in the population being tested. The ATS and CDC state that since the general population of the US has an estimated M. tuberculosis infection rate of 5-10% and the annual incidence of new tuberculosis infection without known exposure is estimated to be 0.01-0.1%, the tuberculin skin test has a low positive predictive value in individuals without a known or likely exposure to M. tuberculosis. To prioritize the use of resources for identifying those at risk for developing tuberculosis and minimize the incidence of false-positive tuberculin test results, the ATS and CDC currently recommend that tuberculin testing be targeted toward groups at high risk and discouraged in those at low risk. The ATS and CDC currently define positive (i.e., significant) tuberculin reactions (i.e., reactions highly likely to indicate true infection with M. tuberculosis) in terms of 3 cut-off points (i.e., levels of induration) based on the sensitivity, specificity, and prevalence of tuberculosis in different groups: 5 mm or more of induration for individuals at highest risk for developing clinical tuberculosis, 10 mm or more of induration for those with an increased probability of infection or with clinical conditions predisposing to enhanced progression of infection to active tuberculosis, and 15 mm or more of induration for individuals at low risk in whom tuberculin testing generally is not indicated. Individuals with known or suspected human immunodeficiency virus (HIV) infection. In several randomized, controlled trials, isoniazid therapy for 6-12 months substantially reduced the incidence of clinical tuberculosis in patients with HIV infection who had induration reactions to tuberculin skin tests of 5 mm or greater. HIV infection contributes most to an increased risk of progression of latent tuberculosis infection to the active disease, and patients of any age with HIV infection who have an induration reaction of 5 mm or greater to the Mantoux tuberculin skin test should receive therapy for latent tuberculosis infection after excluding the presence of clinically active tuberculosis, unless such therapy is medically contraindicated. In addition, falsely insignificant tuberculin reactions may occur in patients with human immunodeficiency virus (HIV) infection because of immunosuppression associated with this infection, and the ATS, CDC, and some clinicians recommend that patients with HIV infection and known exposure to active tuberculosis be given preventive therapy even in the presence of a negative (< 5 mm induration) tuberculin skin test reaction. Patients with HIV infection, whether symptomatic or asymptomatic, may be anergic, and it had previously been recommended that all individuals who were HIV seropositive be evaluated for cell-mediated immunity (delayed-type hypersensitivity) using at least two other antigens (i.e., mumps skin test antigen, candida, tetanus toxoid) at the time tuberculin skin testing was performed. However, the ATS and CDC no longer recommend anergy testing for use in identifying tuberculosis infection, including in HIV-infected individuals because the usefulness of such testing in identifying tuberculin-negative, HIV-infected individuals who might benefit from treatment of latent tuberculosis infection has not been demonstrated. Instead, the ATS, CDC, and some experts state that there may be selected situations in which evaluation of anergy may assist in guiding individual decisions about therapy for latent tuberculosis infection (e.g., in individuals with insignificant reactions to tuberculin from populations at high risk for Mycobacterium tuberculosis infection).Although therapy for latent tuberculosis infection in tuberculin-negative HIV-infected patients has not proven effective, therapy with isoniazid may be beneficial for tuberculin-negative children who are born to HIV-infected women and who are close contacts of an individual who has infectious tuberculosis, as well as in HIV-infected adults who reside or work in institutions (e.g., prisons, jails, homeless shelters) and are continually and unavoidably exposed to patients who have infectious tuberculosis. Some experts recommend continuing isoniazid therapy for latent tuberculosis infection indefinitely in HIV-infected individuals who have an ongoing high risk for exposure to M. tuberculosis (e.g., inmates of prisons in which the prevalence of tuberculosis is high). Since HIV-infected individuals are at risk for peripheral neuropathy, those receiving isoniazid should also be given pyridoxine.Because the risk of tuberculosis appears to be increased in patients with HIV infection, and the association between tuberculosis and AIDS is most evident in IV drug abusers, attempts should be made to identify IV drug abusers who have a significant reaction to the Mantoux tuberculin skin test and to initiate isoniazid treatment of latent tuberculosis infection in such individuals regardless of their age. The CDC states that HIV-infected patients with a history of prior untreated or inadequately treated tuberculosis that healed who have no history of adequate treatment for tuberculosis should receive therapy for latent tuberculosis infection regardless of their age or the results of tuberculin skin tests. Close contacts of individuals with recently diagnosed clinical tuberculosis. Contacts of individuals with infectious pulmonary tuberculosis who have a standard Mantoux tuberculin skin test induration reaction of 5 mm or more (significant reaction) and do not have a history of significant reactions in the past should be considered as recently infected and should, regardless of age, receive therapy for latent tuberculosis infection. The AAP states that regardless of the results of tuberculin skin testing, therapy for latent tuberculosis infection should be given to individuals exposed within the previous 3 months to a potentially contagious case of tuberculosis, especially contacts of immunologically impaired (e.g., HIV-infected) individuals and all household contacts younger than 4 years of age who are exposed to any adult with active tuberculosis, once clinical disease has been ruled out. The ATS and CDC state that children younger than 5 years of age should be treated for latent tuberculosis infection regardless of their tuberculin skin test results because of their susceptibility to severe disease. Recent contacts and household contacts of any age, particularly if they are from a population with a high prevalence of tuberculosis, also should receive treatment for latent tuberculosis infection even in the absence of a significant tuberculin test result. These contacts should be tested again 8-12 weeks after the last exposure to the infectious source and if they still have an insignificant reaction and exposure has ended, therapy may be discontinued. The ATS, CDC, and AAP state that management of a neonate whose mother or other household contact has tuberculosis should be individualized. In an infant whose mother or other household contact has a significant reaction to the Mantoux tuberculin skin test and no evidence of current tuberculosis, the ATS and CDC state that a Mantoux tuberculin test (5 TU/0.1 mL) should be administered at 4-6 weeks of age and again at 3-4 months of age. The AAP states that management of a neonate whose mother (or household contact) has latent or active tuberculosis is based on categorization of the infection. If the mother (or household contact) has a normal chest radiograph and is asymptomatic, the mother or contact usually is a candidate for treatment of latent tuberculosis infection; the infant needs no special evaluation or therapy and need not be separated from the mother. However, if the mother (or household contact) has an abnormal chest radiograph, the AAP advises that the mother or contact and infant be separated until the mother or contact has been evaluated for clinical tuberculosis and, if active tuberculosis is found, is receiving appropriate antituberculosis therapy.Evaluation of other members of the household or extended family to whom the infant may later be exposed also is indicated. When the family cannot be tested promptly, the ATS and CDC state that administration of isoniazid 10 mg/kg daily to the infant should be considered until skin testing of the family has excluded contact with a case of active tuberculosis; isoniazid treatment in the mother also should be considered. In a neonate whose mother has current tuberculosis, the AAP recommends that the infant be evaluated for congenital tuberculosis and tested for HIV infection. A chest roentgenogram and Mantoux tuberculin test should be performed at 4-6 weeks of age; if the results of these tests are negative, the infant should be tested again at 3-4 months and at 6 months of age. The ATS, CDC, and AAP state that the infant should receive isoniazid even if the tuberculin skin test and chest roentgenogram do not suggest tuberculosis since cell-mediated immunity of a degree sufficient to mount a significant reaction to tuberculin skin testing may not develop until as late as 6 months of age in an infant infected at birth. Isoniazid can be discontinued if the results of a Mantoux skin test are negative at 6 months of age (or at 3-4 months of age according to the AAP) and active tuberculosis is not present in family members or if active disease is being treated and family members are no longer contagious. The infant should be examined at monthly intervals during treatment. If nonadherence to the antituberculosis regimen by the mother is documented, the mother has sputum cultures or smears positive for acid-fast bacilli, and supervision is impossible, the ATS, CDC, and AAP state that administration of BCG vaccine to the infant may be considered.However, the ATS, CDC, and AAP state that response to the vaccine in infants may be delayed and inadequate to prevent tuberculosis disease. In a neonate whose mother has hematogenous spread of tuberculosis (e.g., meningitis, miliary disease, bone involvement), congenital tuberculosis in the infant is possible. If the infant is suspected of having congenital tuberculosis, the AAP recommends that a Mantoux tuberculin skin test, chest radiograph, lumber puncture, and appropriate cultures should be performed promptly, and regardless of the skin test results, treatment of the infant should be initiated promptly. If clinical and roentgenographic findings do not support the diagnosis of congenital tuberculosis, the infant should be separated from the mother until she is judged to be noninfectious. 166 If the diagnosis of congenital tuberculosis is excluded, the AAP states that isoniazid should be given until the infant is 3-4 months old; the skin test should be repeated following isoniazid therapy. If the skin test is positive, isoniazid should be continued for a total of at least 9 months in HIV-negative children 145, 163 or for 9-12 months in HIV-infected children. Individuals receiving organ (e.g., renal, cardiac) transplants or prolonged corticosteroid or other immunosuppressive therapy. Although the exact risk is unknown, individuals receiving prednisone in daily dosages of 15 mg or more (or its equivalent) for at least 1 month are at increased risk for reactivation of tuberculosis; risk increases with increasing dosage and duration of corticosteroid therapy. Such individuals should receive treatment for latent tuberculosis infection if they have tuberculin skin test reactions of 5 mm or greater. The ATS and CDC further state that immunosuppressed individuals, including those with HIV infection, who are contacts of those with active tuberculosis should receive treatment for latent tuberculosis infection even in the absence of a significant tuberculin skin test upon repeated testing. Individuals with pulmonary fibrotic changes on chest radiographs that are consistent with prior, healed tuberculosis. Such individuals reportedly have a risk for progression to active tuberculosis of 2-13.6 cases per 1000 patient-years of observation and should receive treatment for latent tuberculosis infection when they have tuberculin induration reactions of 5 mm or more. Individuals with an induration reaction of 10 mm or more to the standard Mantoux tuberculin skin test who have other clinical conditions associated with an increased risk of tuberculosis, including those with silicosis, hematologic and reticuloendothelial diseases such as leukemias or lymphomas (e.g., Hodgkin’s disease), individuals who have diabetes mellitus or chronic renal failure, and individuals known to be seronegative for HIV who inject illicit drugs. Individuals with clinical situations associated with substantial, rapid weight loss (10% or more of body weight) or chronic undernutrition, including intestinal (jejunoileal) bypass surgery for obesity, gastrectomy, or carcinomas of the head or neck and lung, should also receive isoniazid preventive therapy if they have an induration reaction of 10 mm or more to the standard Mantoux tuberculin skin test. Recent immigrants (within the past 5 years) from countries with a high prevalence of tuberculosis (e.g., Latin America, Asia, Africa). Residents of facilities for long-term care (e.g., correctional institutions, nursing homes, mental institutions), hospitals and other health-care facilities, residential facilities for patients with acquired immunodeficiency syndrome [AIDS], homeless shelters). Staff of facilities (e.g., correctional institutions, nursing homes, mental institutions, other health-care facilities, schools, child-care facilities) in which an individual with current tuberculosis would pose a risk to large numbers of susceptible individuals and mycobacteriology laboratory personnel, also may be considered for therapy of latent tuberculosis infection. Children younger than 4 years of age or infants, children, and adolescents exposed to adults in high-risk categories. Some evidence suggests that untreated infants with latent tuberculosis infection have up to a 40% risk of developing tuberculosis; the risk for progression of infection to active disease gradually decreases throughout childhood. Isoniazid therapy for latent tuberculosis infection is more effective in reducing the risk of clinical tuberculosis in children than in adults, with reported risk reductions of 70-90% in clinical trials. Therefore, such therapy is recommended in children and adolescents who have tuberculin skin test reactions of 10 mm of induration or greater following exposure to adults at high risk for tuberculosis infection or disease. The ATS and CDC state that routine tuberculin skin testing is not recommended for populations at low-risk for latent tuberculosis infection. However, if tuberculin testing is conducted in such individuals (e.g., at a work site in which risk of exposure to tuberculosis is anticipated and an ongoing testing program is in place), treatment for latent tuberculosis infection may be considered in those who have a tuberculin reaction (induration of 15 mm or greater) based on an individual assessment of risks and benefits. Prior to initiation of isoniazid therapy for latent tuberculosis infection, patients should be screened to exclude from therapy those with clinical tuberculosis, those who have previously received adequate therapy or for latent or active tuberculosis, those with acute or unstable liver disease of any etiology, and those with a history of severe adverse reactions to isoniazid or other conditions that may necessitate special precautions or contraindicate use of the drug. (See Cautions and also see Drug Interactions.) Because of the risk of inducing isoniazid resistance if the drug is used alone in an individual with current tuberculosis, one of the recommended regimens for treatment of tuberculosis should be used until the diagnosis is clarified.If the evaluation confirms that the patient has latent (not active) tuberculosis, multiple-drug therapy may be discontinued after 4 months in adults or 6 months in children. The ATS and CDC currently recommend a 9-month daily isoniazid regimen or, alternatively, a 9-month twice-weekly isoniazid regimen for both HIV-infected and HIV-negative adults. A 9-month daily or twice-weekly isoniazid regimen also is recommended for treatment of latent tuberculosis in most infants and children; some experts recommend that isoniazid be given for 9-12 months in HIV-infected children with latent tuberculosis infection. Although a 9-month regimen is preferred, the ATS and CDC state that a 6-month daily isoniazid regimen or, alternatively, a 6-month twice-weekly isoniazid regimen can be used in HIV-negative adults. The 6-month regimens provide substantial protection and may offer a more cost-effective outcome than the 9-month regimen based on individual decisions by health departments or other providers. However, 6-month regimens are not recommended for children, HIV-infected individuals, or individuals with radiographic evidence of prior tuberculosis. Isoniazid treatment for latent tuberculosis infection has been given for 6-12 months. Regimens shorter than 6 months may not be effective. A large (about 28,000 individuals), controlled, 5-year follow-up study conducted by the Committee on Prophylaxis of the International Union against Tuberculosis (IUAT) showed that administration of isoniazid for 3 months to individuals with a positive tuberculin skin test reaction and with previously untreated, fibrotic, pulmonary lesions was no more effective than placebo in preventing tuberculosis during the 5-year follow-up period, whereas a 6-month regimen was more effective than placebo. Studies comparing various lengths of isoniazid therapy (e.g., 3-12 months) for treatment of latent tuberculosis infection in patients not known to be infected with HIV indicate that the optimal duration appears to be 9 months and that therapy for longer than 12 months does not provide additional benefit. Although the benefit of a 12-month regimen was better than placebo, overall it was not substantially better than the 6-month regimen, principally because of patient noncompliance during the last 6 months of therapy. Among individuals with good compliance during the entire 12 months, the 12-month regimen was substantially more effective in preventing tuberculosis among patients with small pulmonary lesions than the 6-month regimen. Similar levels of protection against tuberculosis disease have been observed with isoniazid therapy for latent infection regardless of the patient’s HIV serostatus or whether the drug was given intermittently twice weekly rather than daily (for 6 months). Therefore, although the recommended duration of therapy for latent tuberculosis infection is 9 months, the ATS and CDC suggest that every effort should be made to ensure compliance with isoniazid preventive therapy for at least 6 months. The ATS and CDC state that completion of therapy for latent tuberculosis infection is based on the total number of administered drug doses, not the duration of therapy alone. Interruptions in antituberculosis preventive therapy because of drug toxicity or other reasons should be considered when calculating the point at which such therapy is to be discontinued. Regimens in which isoniazid is given daily should consist of at least 270 doses administered within 12 months (allowing for interruptions in the usual 9-month regimen). The 6-month isoniazid regimen should consist of at least 180 doses given within 9 months. Isoniazid regimens in which the drug is given twice weekly should consist of at least 76 doses administered within 12 months (for the 9-month regimen) or at least 52 doses within 9 months (or the 6-month regimen). Reinstitution of therapy in patients whose treatment has been interrupted might require a continuation of the regimen originally prescribed (as long as needed to complete the recommended duration of the particular regimen) or a complete renewal of the regimen. In either situation, when therapy is resumed after an interruption of 2 months or longer, a medical examination is indicated to rule out tuberculosis disease. All patients receiving an intermittent (twice-weekly) isoniazid regimen for the treatment of latent tuberculosis infection should receive directly observed therapy (DOT); the ATS and CDC state that when feasible, DOT also should be used in some special settings (e.g., some institutional settings, community outreach programs, household contacts of patients with tuberculosis who are receiving home-based DOT). AAP states that when the patient cannot be relied on to adhere to daily isoniazid therapy, the drug may be given twice weekly by directly observed therapy (DOT), preferably after 1 month of daily therapy. While isoniazid monotherapy generally is the regimen of choice for the treatment of latent tuberculosis infection, a 4-month regimen of daily rifampin monotherapy can be used as an alternative regimen in both HIV-positive and HIV-negative patients, especially when isoniazid cannot be used because of resistance or intolerance. Limited data suggest that a short-course (e.g., 2-month) regimen consisting of rifampin and pyrazinamide given daily is effective in treating latent tuberculosis infection in HIV-infected patients, and the ATS and CDC state that the efficacy of this regimen is not expected to differ in HIV-negative patients. However, hepatotoxicity (including some fatalities) has been reported in patients receiving rifampin and pyrazinamide regimens for the treatment of latent tuberculosis and, although multiple-drug regimens containing rifampin and pyrazinamide are still recommended for the treatment of active tuberculosis, the ATS, CDC, and IDSA now state that regimens containing both rifampin and pyrazinamide generally should not be offered for the treatment of latent tuberculosis in either HIV-infected or HIV-negative individuals. Factors to consider in selecting the appropriate regimen for treatment of latent tuberculosis infection in HIV-infected individuals include the likelihood that the infecting organism is susceptible to isoniazid (isoniazid is the preferred agent for isoniazid-susceptible M. tuberculosis), the potential for drug interactions with rifampin in patients receiving HIV protease inhibitors or NNRTIs, and the possibility of severe liver injury with pyrazinamide-containing regimens. Choice of therapy requires consultation with public health authorities if the infecting organism is resistant to isoniazid and rifampin. Recommendations for treatment of latent tuberculosis infection in HIV-infected adults generally are similar to those for HIV-negative adults; however, the 6-month isoniazid monotherapy regimen usually is not recommended and use of rifabutin monotherapy may be necessary instead of rifampin monotherapy if there are concerns about drug interactions with antiretroviral agents the patient may be receiving. The ATS and CDC recommend that HIV-infected adults and adolescents with latent M. tuberculosis infection receive a 9-month regimen of isoniazid given daily or twice weekly; a 4-month regimen of rifampin or rifabutin given daily; or a 2 to 3-month regimen of rifampin and pyrazinamide given daily (this regimen no longer recommended in most patients). For HIV-infected infants and children, recommended regimens for the treatment of latent tuberculosis infection are a 9- to 12-month regimen of isoniazid given daily or twice weekly or a 4- to 6-month regimen of rifampin given daily. For pregnant women who are at risk for progression of latent tuberculosis infection to active disease, particularly those who have HIV infection or have been infected recently, the ATS and CDC state that the initiation or discontinuance of therapy for latent tuberculosis infection should not be delayed on the basis of pregnancy alone, even during the first trimester. For women whose risk of active disease is lower, some experts recommend delaying treatment until after delivery. Patients with HIV infection or radiographic evidence of prior tuberculosis should receive 9 rather than 6 months of isoniazid therapy. The ATS and CDC state that some experts would use rifampin and pyrazinamide as an alternative regimen for treatment of latent tuberculosis infection in HIV-infected pregnant women, although pyrazinamide should be avoided during the first trimester. The ATS and CDC state that a regimen of isoniazid administered daily or twice weekly for 9 or 6 months is recommended in these pregnant women who do not have HIV infection. 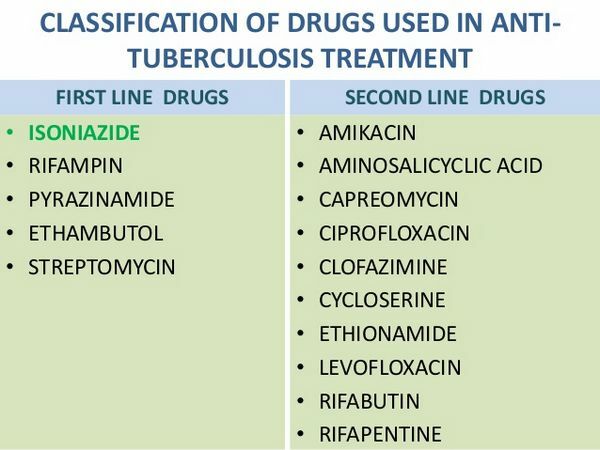 In individuals likely to be infected with M. tuberculosis organisms that are resistant to both isoniazid and rifampin and are at high risk for developing tuberculosis, the ATS and CDC recommend regimens consisting of pyrazinamide and ethambutol or pyrazinamide and a quinolone anti-infective (e.g., levofloxacin or ofloxacin) for 6-12 months if the organisms from the index case are known to be susceptible to these drugs. Immunocompetent contacts may be managed by observation alone or be treated with such regimens for 6 months; immunosuppressed individuals, including those with HIV infection, should be treated for 12 months. Clinicians should review the drug-susceptibility pattern of the M. tuberculosis strain isolated from the infecting source-patient before selecting a regimen for treating potentially multidrug-resistant tuberculosis infections. In individuals likely to have been infected with M. tuberculosis organisms that are resistant to both isoniazid and rifampin, the choice of drugs used for treatment of latent infection requires expert consultation. Prior to initiation of therapy for latent tuberculosis infection in patients with suspected multidrug-resistant tuberculosis, careful assessment to rule out active disease is necessary.